Editor’s Note: Product Snapshot is an ongoing series of bar, nightclub and restaurant product reviews. If you have a product that you would like reviewed please send a product fact sheet or formal press release, image and contact information Kristen Santoro at [email protected]. This year’s National Restaurant Show had no shortage of great new products, our favorite old standby’s, and all sorts of delicious foods and snacks. Hello, Lil’ Orbits Donuts! There are too many products at the event to review, but there were the usual couple of stand outs-specifically ones we think our readers would enjoy. Let’s start with Holdaplate LLC. Anyone who’s been to a cocktail party needs a Holdaplate. This clever contraption allows you to hold a beverage and a plate comfortably in one hand – with ease! No more fumbling or searching for a rare open spot at a table. Holdaplate really solves the impossible task of eating and drinking while standing, and is a simple yet genius product. Next is ICETRO and their frozen beer… yes you read that right, frozen beer. This would be the perfect drink while sitting pool side in Miami, or even at any nation-wide summer patio. It makes one wonder why this hasn’t been invented sooner? The actual taste lives up to the idea in theory. This product was just the right combination of icy & refreshing and your typical quality brew. 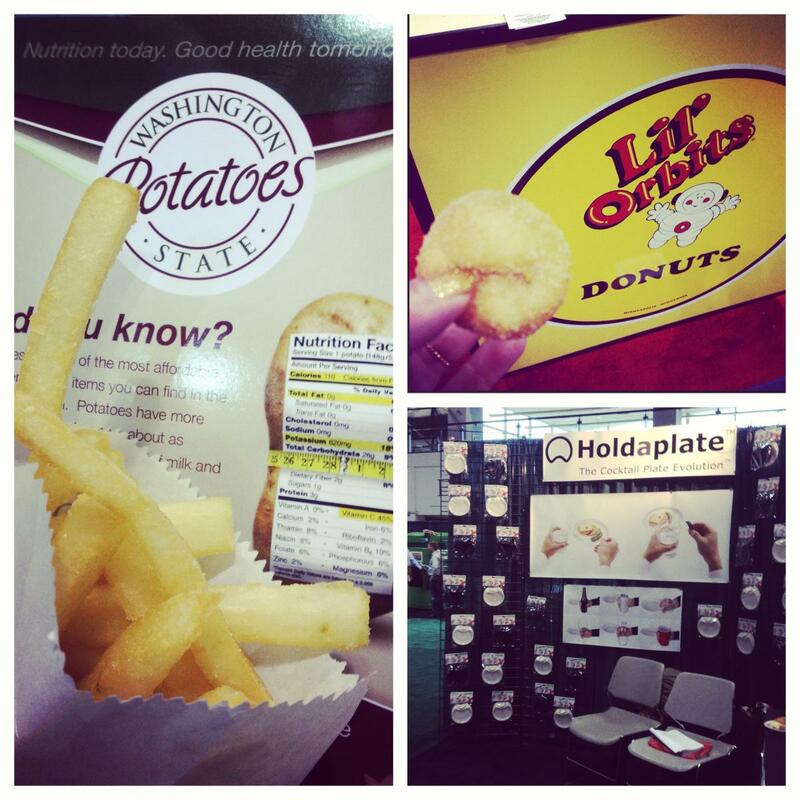 Washington State Potato Commission served fries that would be a great addition to any bar or restaurant. Easy to make, and the perfect side to your typical bar fare. However, these fries are anything but typical. Found Beverage Co displayed their line of flavored sparkling waters available in Apple & Cinnamon, Cucumber & Mint, Elderflower and Lemon varieties. The Cucumber & Mint was extremely refreshing and full of flavor. Any of them would enhance and contribute to a craft cocktail or to be enjoyed on its own. The dominating trends at this year’s 95th annual event seemed to be not short of including: going green, gluten-free foods, organic foods, baked goods, desserts, coffee (lots and lots of coffee, per usual), restaurant management systems, and customer loyalty programs. Magic Johnson delivered the keynote, and there was no shortage of food personalities presenting culinary demonstrations or signing their well-selling cookbooks; including Rocco DiSpirito, Andrew Zimmern, Fabio Vivani, Ming Tsai, Anne Burrell, Rick Bayless, and more.